The man with the crazy ideas, and the vision from heaven vindicating them. 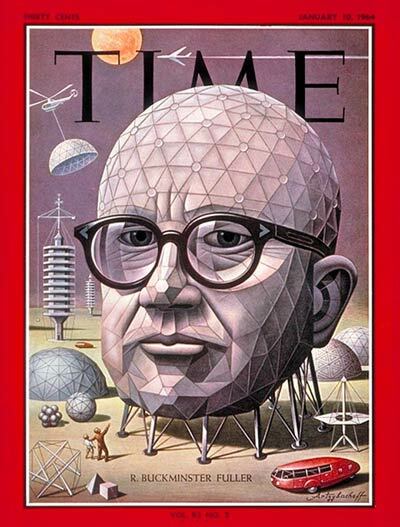 Buckminster Fuller grew up in the great surge of technology–first car ride at 8 years old, first plane flight at 16, etc. The main way Buckminster innovated was through his passion for generalization. In an age of increasing specialization, he provides us a case-in-point of what cross-disciplinary pollination can do for scientific and intellectual thought. I am more inspired by this contribution–the appeal for generalization in knowledge and education–than anything else he did. But, he had some really crazy ideas. Buckminster (what a name!) was typical for an intellectual of the 20th century, which means he went crazy with all the untapped potentials which were new and which provided infinite imaginings and ideas (e.g., Picasso, Stravinsky, etc.). His first crazy idea was to build a house which could fly in on a Zeppelin. He applied himself to housing because it had seen the least progress in human history. He felt that modern houses were crude and outdated, so he made circular houses that hang on masts. He called his house the Dymaxion House, and dubbed them the “machine for living” in the machine-age. Financially the car and its company crashed and was shut down after a freak accident at a Chicago world’s fair. One day, as he was driving through the farmlands, he noticed the all-metal grain silos and had his next epiphany: He would make fire-proof houses from grain bins. Everyone mocked his idea, but he stuck with it. His philosophy of architecture was more function over form, and his diatribe for the beauty of functionality is something reminiscent of what Steve Jobs said about design being about elegance in performance more than mere aesthetics. You’re gonna have to find out what needs to be done, and that is the design responsibility, so when you hear everybody out here talking about ecology’s over, it’s because your architecture’s not doing anything. People can just sit around and draw pictures, and well it’s pretty, so that’s enough. You don’t ever have to worry about beauty or pretty because if you really understand your problem, if you solve it correctly so that life really goes on–this is the regeneration of life–and you do it so economically that it is realizable, it always comes out beautiful. That is why a rose is beautiful. It is just one of those parts to the great regenerative process where there is an a priori design of the universe that had the universe working. You want to be a part of that, you can’t miss beauty. Your joy will be there; it will be just as much with a beautiful sunset. The last and greatest idea Fuller is remembered for is the Geodesic Dome. One colleague said Buckminster was placed on the earth for this one reason: the dome. Some people responded with praise and others with raised eyebrows, but nobody denied he was a veritable idea factory. His brilliance came from his ability to relate everything to everything and come away with a fresh innovation. He ended his lectures with the dome even though he began with philosophy and ethics. The marine corps picked up his domes in the 1950’s. It was his first and greatest true business success. His dome was 1% the weight of traditional domes. Hawaii put one up for their symphony house, and it took 30 men only 22 hours to construct it. Americans used the dome for churches, barns, homes, schools, movie theaters, concert halls, the stadium for the Brooklyn Dodgers, and so forth. I did not set out to design a house on a pole, a three wheeled car, or geodesic structures. My objective has been humanity’s comprehensive welfare in the universe. I could have ended up with a pair of flying slippers. In 1967, he built the US pavilion for the world’s fair. It was a huge dome, 250 feet in diameter, the largest clear spanning structure in the world. He felt it vindicated his life’s struggles. And in 1968, he received the World gold medal for architecture. Buckminster Fuller - Thinking Out Loud Youtube Video.